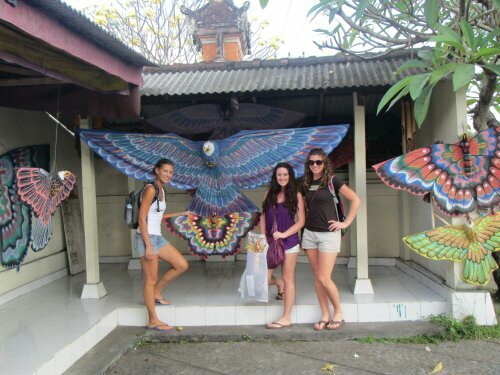 From Uluwatu, we took a mini bus to Ubud. On the way we stopped in the art district to check out some paintings, kites and a temple. 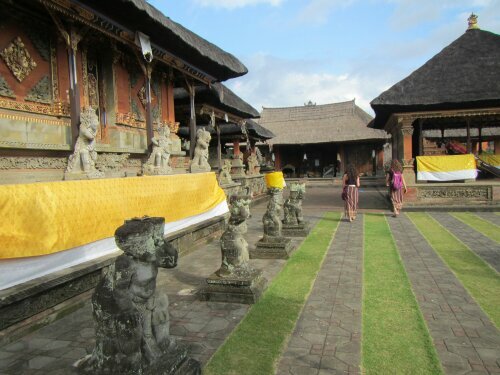 The temple required us to wear a sarong and tie around our waste. This temple was very different from the others I had seen in other countries. It was the first temple I saw that was made of red brick. After we stopped off to have dinner right by a beautiful rice field. The first night we stayed in a mosquito infested room with an outdoor private bath that wasn’t so private. The building in the back had a view of our bathroom. The next two nights we upgraded to the beautiful Champlung Hotel that is butted up against the Ubud Sacred Monkey Forest. 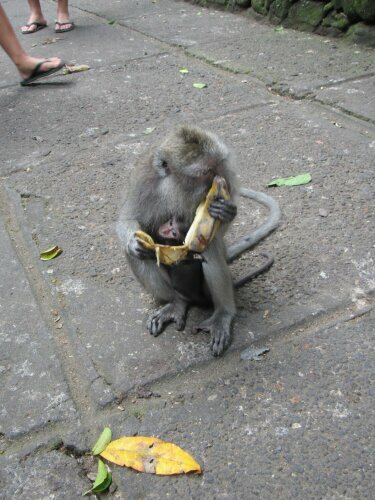 We had many monkey sightings around the hotel grounds, which is why we think we all think its the best place to stay in ubud. 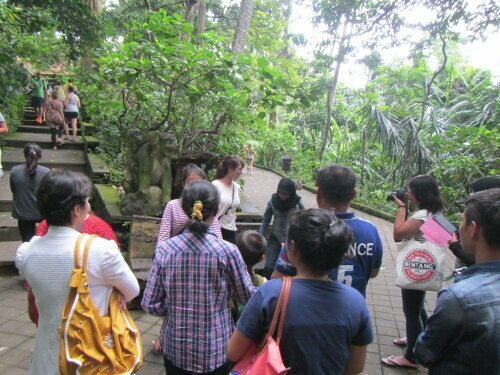 Meagan and Mandy were a little shaken up from their Uluwatu monkey encounter, so we went to the Sacred Monkey Forest prepared. 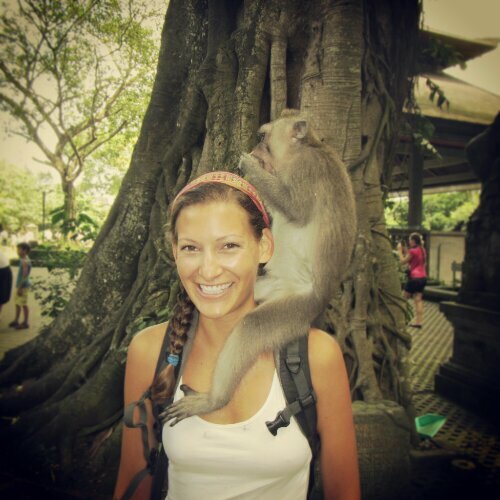 We wore tennis shoes to ensure that the monkeys wouldn’t steal our flip flops like they had done to Meagan in Uluwatu. The monkeys temperament was way more mellow and playful. 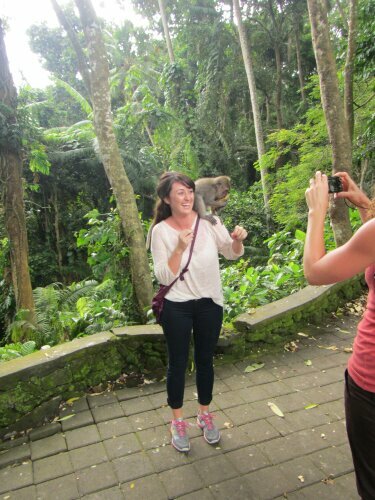 We all held up a banana to coax them to climb up on our shoulder. There were plenty of babies holding on to their moms chest and tons of monkey line the walk ways cleaning each other’s fur and they are in search for bananas. 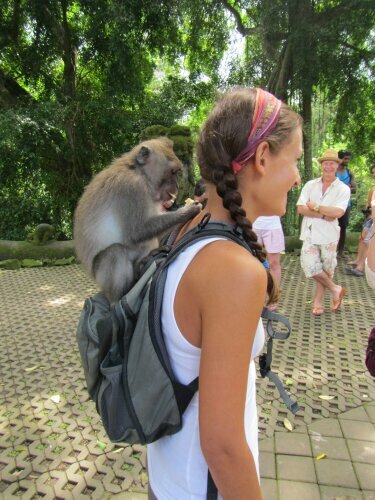 Even though we were no longer scared of the monkeys, we still dreaded mosquitoes. Mandy is hilarious, before going to bed she would cover her head with her sarong so that the mosquitoes wouldn’t get her. Lol! Oh and I almost forgot. Did you know that Meagan Holmwood is famous? A group of Asian tourists asked to take a picture with her. They didn’t ask Mandy and I; only Meagan. Lol! The whole group jumped into the picture then after some people took more pictures with Meagan. Other western tourists stopped looking at Meagan, trying to place what actress or singer she was. Next we went to a spa and got pampered. Forest Day Spa, is the bomb and has really good prices! I got a flower on my nails, because apparently that’s why I have no boyfriend. 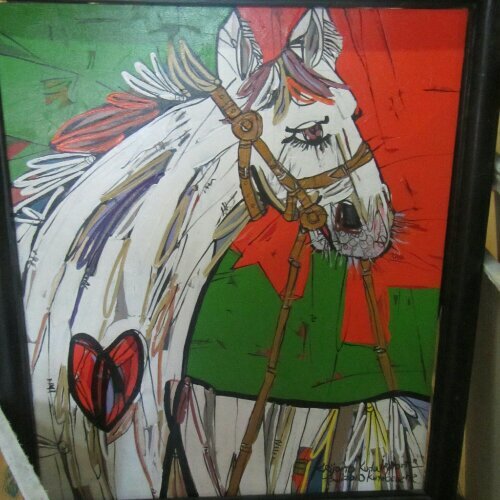 I also liked Krijono, who paints very colorful ethnic paintings or people and animals. Very expensive as well. 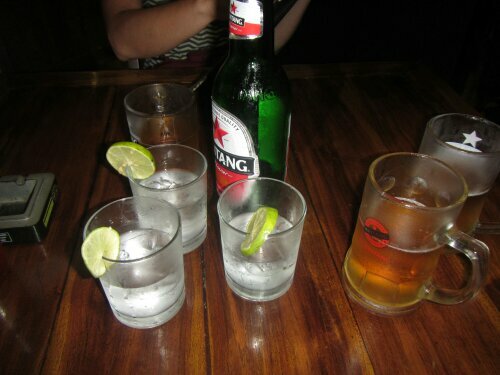 Arok is an Indonesian hard alcohol. We tried it straight up and it tasted like dirty socks. Yuk! Even putting sprint in it would make it better. Our next stop will be Gili T, an island off the coast of Bali. 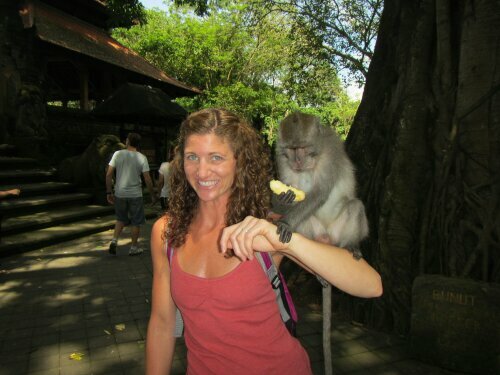 This Post was posted in Indonesia, World Trip 2013 and tagged arok, monkeys, ubud. Bookmark the permalink. Hi, where can I find Mohammed’s apprentice, Plisto? Hi Karen, sorry this is a very late. 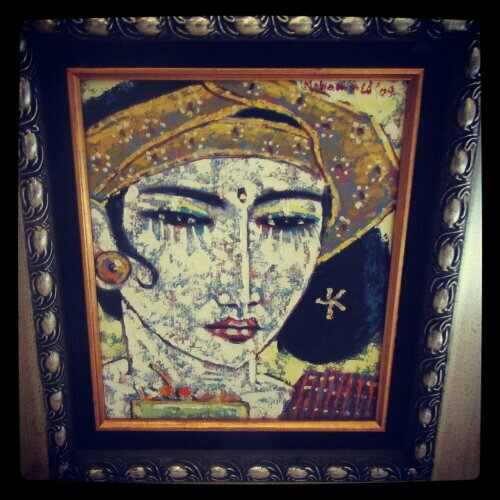 You will be able to find his work at many galleries along the main strip in ubud. Good luck! Hello! Do you remember the name of the gallery where you got your paintings? Hi Isabela, I’m sorry but I don’t recall the name of the gallery. Are you going there? It’s on the main strip so I’m pretty sure you’d be able to find his work. His work was at many different galleries.